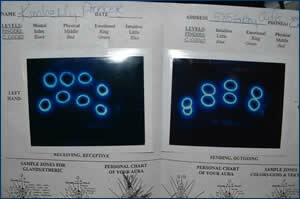 The Kennedy Kirlian Technique includes an “aura-energy” photo with an optional analytical interpretation by a trained consultant (or by oneself). KKT uses low-voltage, high-frequency equipment to measure your electrical body energy by photographing the fingertips. These impressions record four states of consciousness - physical, mental, emotional, and intuitive - with each finger representing one of these levels. The health and condition of the entire body is identified along with electromagnetic and nutritional considerations. After years of research, Dr. Kennedy discovered that “fingertips” could be charted, similar to Dr. Bernard Jensen’s system of charting the eyes (Iridology). Kennedy developed the first portable briefcase-size Kirlian machine with “on-site” diagnostic capabilities. He is the key individual in the United States responsible for the advancement of Kirlian research and methodology. He has personally taken thousands of photos with analysis since the 1970s and offers seminars and training programs for professionals who purchase a Kirlian unit. 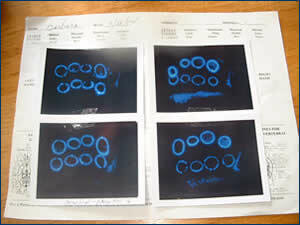 Kirlian Photography demonstrates visually on Polaroid film your energy field and instantaneously records impressions related to your well-being. This is significant because it shows the strengths and weaknesses not only at the physical level (organs, glands, vertebrae) but also shows how your health is affected positively or negatively by your mental attitude, emotional state, and intuitive insight. This allows choices by giving advance notice of disease patterns before manifesting physically, so that appropriate adjustments in diet, behavior, and lifestyle can be addressed. Your photographed fingertip impressions will look bright and strong or weak. Weaknesses show up as thinnesses or with gaps in the impressions. Such indicators show where the electromagnetic (EM) energy is no longer flowing and balanced, but blocked and stagnant. The position where these weaknesses occur on the impressions, indicate organ stresses as well as chemical and environmental effects on the body. There are four main categories to consider when analyzing and charting your own KKT-zones, quadrants, awareness levels and color-coding. *The Zones on each chart are like a clock, starting at noon and continuing clockwise back to 12:00. Within each Zone are associations to appropriate organs, glands, colors-gems and vertebrae. *The KKT method divides the “fingertip-body” chart into four Quadrants. They include Earth, Spirit, Male and Female sections, Certain qualities are associated in each area. Earth: physical, grounding, energetic. Spirit: etheric, spiritual, heavenly, mystical. Male: logical, practical, security-minded, left-brain thinking, materialistic. Female: sensitive, intuitive, nurturing, artistic, right-brain dominance. *Two rows of impressions are taken for each hand. Each represents your levels of Awareness. Row One represents your electrical and Beta levels; what you consciously perceive as reality. Row Two signifies your chemical, constitutional and Alpha levels; subconscious thoughts and unknown/hidden fears & resistances. *A Color-Coding system is used representing each finger and level of consciousness (M, P, E, I). It does not mean you have those colors in your aura. These colors are transposed and appropriately recorded/colored onto the chart to signify the M, P, E, or I levels. Use Black for Mental, Red for Physical, Green for Emotional, and Blue for Intuitive levels. *How To Color: First find a weak spot in your aura photo. Then look at what zone it is in and match/transpose it to the zone on the body chart. Transpose it by placing/marking one appropriate color at a time on the aura circle of the body chart. This helps visualize patterns of weakness and intensity (i.e. Four colors in the same zone means greater attention is needed at those levels and with specific concerns).